We are truly north facing with cooling sea breezes which makes Rainbow Place very comfortable during the summer months. Amazing Coolangatta, Second to none! Holidaying at Rainbow Place means that you and your family will be swimming in one of the safest patrolled beaches, on the Gold Coast. Patrolled 365 days a year. With only a 5 minute walk to Coolangatta, Rainbow Place suits all your Coolangatta Accommodation needs! 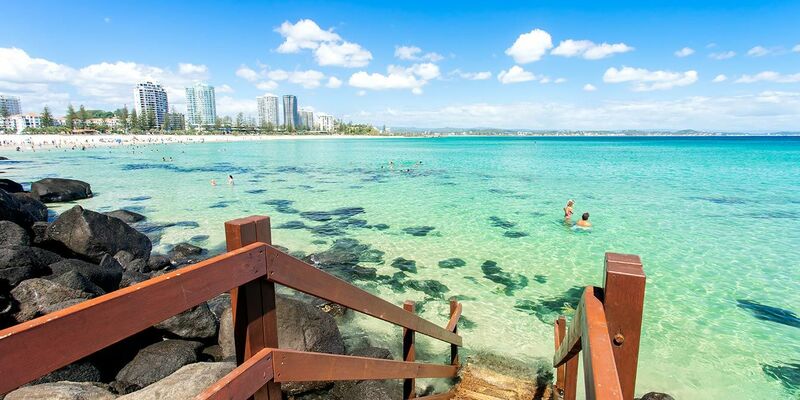 Coolangatta and Tweed Heads is just a short stroll from Rainbow Place Holiday Apartments, with the newly renovated Strand shopping Centre in Coolangatta and beach front restaurants to suit everyone’s needs or catch dinner and a show at the famous Twin Towns RSL Club. Rainbow Place is located only 10 minutes away from Gold Coast Airport which means you can start the holiday faster when you holiday with us. Rainbow Place Facilities, You deserve the best! Our building consists of 3 apartments per level in a 15 storey building. Ideally positioned at Rainbow Bay Coolangatta on the quieter southern end of the Gold Coast, right next Snapper Rocks. Ideal for that getaway break or a great family holiday. Over the last few years we have embarked on a comprehensive apartment renovation program. All our Rainbow Bay apartments have been recently renovated.